FREE admission; No ticket required. Culture Shock Miami is a proud sponsor of the Main Stage performances by ILL-Abilities at the 13th annual All Kids Included Festival. It is the policy of Miami-Dade County to comply with all of the requirements of the Americans with Disabilities Act. The All Kids Included Family Arts Festival is designed to be inclusive for children and families of all abilities. The facility is accessible; assistive listening devices, sign language interpreters, sighted guides, and large print and Braille program information will be available. To request materials in accessible format, and/or any accommodation to attend an event at the South Miami-Dade Cultural Arts Center, please contact Stephanie Aponte, 786-573-5314, saponte@miamidade.gov, at least five days in advance to initiate your request, TTY users may also call 711 (Florida Relay Service). 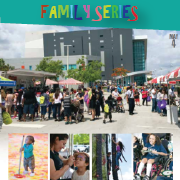 The All Kids Included Family Arts Festival was developed by the Miami-Dade County Department of Cultural Affairs as part of its “All Kids Included - Accessible Arts Experiences for Kids” (AKI) program. AKI is an initiative of the Miami-Dade County Department of Cultural Affairs, made possible with the support of the Miami-Dade County Department of Cultural Affairs andthe Cultural Affairs Council, the Miami-Dade County Mayor and Board of County Commissioners, and in part through grant funding provided by The Children’s Trust. The Children’s Trust is a dedicated source of revenue established by voter referendum to improve the lives of children and families in Miami-Dade County by making strategic investments in their future.